Located on the foot of the highest mountain, the Everest (8848m), Everest Base Camp Trek is one of the most visually as well as spiritually satisfying treks in Nepal. While the up-close view of the snowy peaks of the Mahalangur Himalayan range fills your heart with overwhelming beauty, the many monasteries and small Sherpa villages fill your soul with the culture and hospitality of the legendary Sherpas. The Everest Base Camp Trek begins with a flight to Lukla, an adventure in itself. The trek continues through dense coniferous forests and rocky, ice-filled terrain. With the option to see diverse flora and fauna such as the mountain goat, the snow leopard, various migratory birds, the trek offers breathtaking views of mountains such as Khumbila (5761m), Nuptse (7861m), Ama Dablam (6856m), Thamserku (6608m), and so on. With the Sherpas calling it their home, this region not only soothes you in the mind but it does so in the heart too. Buddhism being the most dominant religion here, you can see its omnipresence in the beautiful monasteries, Chortens, or the multiple prayer flags that flutter with the wind carrying prayers and blessings. As you reach Everest Base Camp, you will be able to get a spectacular view of the mighty Everest (8848m), Lhotse (8414m), Pumori (7161m), and several other snowy peaks. The beauty intensifies as you climb on top of Kala Patthar (5550m) to catch the best view of the glorious Mount Everest (8848m) which looks even more ravishing while being draped by the rays of the rising sun. This trek takes you to some of the other notable places of the region including Namche Bazaar, Tengboche Monastery, Khumjung Monastery, and so on, all of which work beautifully to invite thousands of trekkers in Khumbu every year. With a brilliant team and the best equipment’s, we at Amazing Nepal Treks and Expedition run the finest travel services in Nepal. If you don’t believe us, come to check us out yourself; we have everything you want already packed and ready. Just give us a date and you’re ready to move. Whether it be the mountains or the lush jungles of Terai, you can find just the perfect trip package you want with us. Exploration of UNESCO World Heritage Sites in Kathmandu. Lovely views of the Khumbu Icefall. Hike up to Kala Patthar (5,545m) & Nagarjuna Peak (5,091m). Trek to Everest Base Camp and Khumbu Glacier. Namaste and welcome to Nepal. Our representative will meet you at the airport and transfer you to your hotel. Overnight at the hotel in Kathmandu. Today you will prepare for the trek, which includes making last minute shopping and making sure you have everything for the trip. You will also explore the Kathmandu valley which is a hotpot of culture and tradition of the Hindu and Buddhist faith coming together. Kathmandu boasts of many UNESCO world heritage sites such as Pashupatinath, Boudhanath, and Swayambhunath which you will explore today. You will also chance upon some delicious Nepalese delicacies and brews. Momo, the scrumptious Nepalese version of dumplings, is a must try while in Kathmandu. Overnight at the hotel. An adventure in itself, the flight to Lukla takes you to one of the most dangerous airports in the world. Once you gain height, you will be able to see what makes Nepal beautiful; the hills, the rivers, and the many snowcapped mountains sit peacefully creating gorgeous landscapes. Upon arrival in Lukla, you will start your journey to Everest Base Camp by trekking to Phakding. Enjoying the views of Kusum Kanguru (6367m), and Thamserku (6608m), you reach Phakding for the overnight stay. With the Dudh Koshi keeping you company, you will make your way to Namche Bazar today. The rocky terrain of the region gives a peculiar feel which is unlike any other. As you cross the many suspension bridges, which are the lifeline of this area, you will also walk past many shrines of the Buddhist faith adorned with colorful prayer flags. A gradual uphill trek takes you to Namche Bazaar, a hub for all the tourists that are trekking in and around this region which exhibits a superb example of the Himalayan hospitality. Overnight in Namche Bazaar. Acclimatization is key for any high altitude trek, and you will do so by trekking around Namche and exploring the surrounding areas. You will be witness to the glory of the giant mountains such as Everest (8848m), Ama Dablam (6856m), Thamserku (6608m), Nuptse (7861m), Lhotse (8516m), and so on. You also have the option of visiting the Sherpa Museum which showcases the culture and the way of living of the legendary Sherpas. Overnight in Namche Bazaar. After a fairly easy walk till the village of Phunke Tenga, you will then begin to ascend to reach Tengboche, which has blissfully nestled in its vicinity the Tyangboche Monastery. The oldest and the most sacred in this region, Tyangboche Monastery sits picturesquely in the forefront of the gorgeous Ama Dablam (6856m). If you are lucky, you might be able to observe a religious ceremony being performed in the monastery. The monastery has beautiful walls with beautiful paintings and has small Chorten inside the premises. Overnight in Tyangboche. Today you will descend on the first part of the trek as you cross dense forests of conifers and rhododendrons with splendid views of the Everest (8848m) and Ama Dablam (6856m). As you move further, you will cross the Imja River and reach Pangboche, which also has a monastery and some extraordinary views of the mountains. Through the rocky terrain, you will see multiple fields of different crops as you make a gradual ascend to reach Dingboche. Overnight in Dingboche. Today is the second acclimatization day of this trek, and you will spend the day hiking around Dingboche. The ridge from behind Dingboche offers majestic views of Cho Oyu (8188m), Makalu (8485m), Lhotse (8414m), Taboche (6501m), Cholatse (6440m), and also the beautiful Imja River flowing serenely through the Imja Valley. This hike will not only excite your visual senses, it will also give you a reality check on just how beautiful nature is. Overnight in Dingboche. Initially, you will be walking on a wide path which later becomes narrow and rocky. You will enjoy the scenes of the Himalayas on all your sides as you pass through rather historic places; this area also has the campsite of the first successful Everest summit by Sir Edmund Hillary and Tenzing Norgay Sherpa. You will walk on the steep paths leading to the moraine of Khumbu Glacier and pass through the ridge which has many shrines with colorful prayer flags in the memory of the trekkers who lost their lives during various expeditions. You will notice the peaks of Pumori (7161m), Nuptse (7861m), and snow-covered mountains getting nearer as you reach Lobuche. Overnight in Lobuche. The trek to Gorakshep and then forward to Everest Base Camp is challenging as you will mostly be walking on glaciers and on rough terrains. The rocky terrains often make you struggle to find a balance and thus require slow walking. When you reach Everest Base Camp, you will see many colorful tents set up by the expedition teams against the icy rocky terrain covered in snow. With views of Everest (8848m), Lhotse (8414m), Pumori (7161m), Khumbutse (6749m), and Nuptse (7861m) above and the glacier below, you can get this overwhelming sensation of being a miniscule yet lucky organism. You later hike down to Gorakshep for the overnight stay. Early in the morning before the sun is out, you will make your way to Kala Patthar. You do so because Kala Patthar gives the best view of the mighty Everest (8848m) and the surrounding mountains as the sun gradually rise and the light changes beautifully almost making the mountain feel like they are coming to life. This fills you up with a sense of awe and a sweeping run of emotions. This is also a great opportunity for photo enthusiasts to take lovely photos of the mountains: Everest (8848m), Lhotse (8414m), and many other peaks of the Mahalangur Himalayan Range. After this, you return to Gorakshep and head toward Pheriche. Overnight in Pheriche. You will descend to Kyangjuma today observing the flora and fauna and the obvious views of the mountains you’ve seen for so many days now, and enjoy every bit of it. This region is known for wildlife such as wild pheasants, the wild goats, and the musk deer. As you cross the forests keeping Dudh Koshi Company, you will reach the beautiful village of Kyanjuma. Overnight in Kyanjuma. After breakfast, you will move towards Khumjung, the biggest Sherpa village in Khumbu. Situated here is the Khumjung Monastery that displays a protected skull of the infamous Yeti. You then cross the largest Mani wall of Khumbu and descend to the village of Monjo via Namche Bazaar. Monjo has cute little houses, and there is a lot of livestock transporting goods to various parts of Khumbu. Overnight in Monjo. As you retrace your way from Monjo to Lukla, you begin to realize that today is the last day that you will be spending in the lap of the Himalayas, so you will make the most out of it. This is a good time to reflect upon the life at high altitude and to life back home. This experience is bound to change you in many ways. Overnight in Lukla. As you fly back to Kathmandu, the view below is just as mesmerizing as it was when you first got to Lukla. Upon your arrival in Kathmandu, you will once again be transferred to your hotel. You can rest for some time and then head out to enjoy the vibrant streets of Thamel. Overnight at a 3-star hotel in Kathmandu. This day marks the end of your Himalayan adventure. Our representative will drop you at the airport. Have a safe journey back home, and we hope to see you again. Except for your daypack, all luggage will be carried by porters. A porter is available for two people who will carry maximum up to 25 kg. So, You have to be careful while packing your Bag or luggage. Moreover, There is an allowance of 15kg per person on domestic flights. Additional personal items are not needed for the trekking portion of the trip which can be kept in the hotel’s storage room without extra cost. Mr D P and Amazing Nepal Trek team are a professional outfit. They organized an excellent trip for me and my friend to the base camp of Everest at very short notice and made everything much easier than the other agencies we dealt with. The pre-holiday service was exceptional, with prompt email responses, and D P provided us with all the information we needed. On arrival in Kathmandu we were looked after very well and everything was perfectly organized up until the moment when we left. They even accommodated various changes to our itinerary during the trek. During the trek we had a guide, Dipak, and a porter, Bijay. Both were above excellent. Dipak provided us with a detailed itinerary each day, offered us as much information as we wanted during the hike and looked after us very well, paying careful attention to any altitude sickness symptoms, and was quick to help us across difficult hiking sections. Bijay was a great trekking companion and his help went far beyond what we expected. I will surly go to Nepal again and obviously with no other than Amazing Nepal. Many thanks to D P and his crew!! This was an absolutely brilliant trip of a lifetime and I would thoroughly recommend Amazing Nepal Trek! They are extremely professional, respond very quickly to emails and any questions you have. Nirmal in particular was so helpful before the trip with my uestions and picked me up from the airport and even made arrangements to make sure I got back to the airport safely as well after the trip ended. They are prepared for everything and even provided me a thicker down jacket and sleeping bag before starting the trip as temperatures hit as low as -20 degrees Celsius at night time in February! Our guide Saroj was fantastic, really helpful throughout the entire trek and made sure we got to EBC safely. The standards of everything (food, accommodation) were well beyond my expectations and I was so pleased with my entire experience. I really enjoyed the fresh fruits after every dinner usually you don’t get it in the mountain. Amazing Nepal Trek and Expedition is a great tour company providing the best possible service to their customers. If you want an unforgettable trip and service with a smile and a team who will keep you safe and ensure you are comfortable throughout your trip, this is the company to book with 100%. Can't wait to go back again and explore more of this beautiful country with Nirmal and his team! My family and I just did a 10 day EBC Trek. We are very happy that we selected Amazing Nepal! From communication before our travel to Nepal to our awesome guide Saroj, we had a great experience with this company. The ease of not having to worry about where we were sleeping or eating each day made the trip more enjoyable. If you pick Amazing Nepal ask for Saroj. We observed other companies alnd guides and we would not have traded ours for the world! We had trouble flying to Lukla and leaving Lukla due to weather. Without Saroj, we might not have been able to sort out rebooking flights. We had the trip of a lifetime and now have a forever friend in Nepal. Thank you Amazing Nepal, thank you Saroj for such awesome trip !! I had very good time trekking with Amazing Nepal Trek & Expedition. Upon our arrival in Kathmandu, my friend and I were well greeted by garland. We got into the company's transport and they sent us to our hotel with swift efficiency. On the day of our flight to Lukla, our guide Sudip displayed great enthusiasm in having us. I shall not reveal too much details regarding the itinerary of the trip as it is for you to find out. But I would like to highlight the excellence of service our guide has provided. We did not request for the hiking poles and instantly regretted when the terrain in the Himalayas started to get difficult. Sudip and our porter Ramkaji made a pair of wooden hiking poles out of tree branches for us when we highlighted our concerns. On the 4th day of our trek, I left my camera in one of the resting areas and only realized that my camera was missing when we reached our lunch spot along the river that is already couple of hours away. I started panicking. Sudip and my porter calmed me down and sprinted to the resting area. Fortunately, my camera was still there and Sudip managed to retrieve it. I am deeply indebted to their kindness and professionalism in handling such a distressed situation and gave them each a good tip. Mr. Santosh, the director of Amazing Nepal was also very accommodating. He gave us a surprise souvenir and arranged free transport for us from our hotel to the international airport after a couple of days in Kathmandu. Very humble and welcoming man indeed! All in all, I enjoyed my 12 days Everest Base Camp trek with Amazing Nepal Trek & Expedition and highly recommend this team to those who intend to embark on a journey through the Himalayas. I hope to visit again soon and we will recommend Amazing Nepal Trek to all our family and friends. Namaste!! We had a fabulous 2 week trek to Everest Base Camp!! From the airport pickup to the guides and porter. Everything was handled professionally. Excellent service from our guide Raju and porter Bishnu. Without them our trek will not have been fulfilling and fun. We had a life time memorable trip. Thank you Amazing Nepal for everything! This was the first time i've been to Nepal and im not sure I would have been able to go trekking in the world top mountain with this amazing team behind me. I am only 16, I must also add that it is too great that they were able to take me to the top base camp of the world with awesome facilities and handle. It was my new experience of my life and fully fulfilled by Amazing Nepal Team. I have recently been trekking with Amazing Nepal team through the Everest Base Camp. Their communication was outstanding. This local based company is very knowledgeable and experienced in the trekking sector. Guide was also friendly, good english speaker and expert. Last month I was in Nepal. Amazing Nepal is the best agency for trekking to everest base camp in Nepal. Our Guide Saroj was a great professional, very nice, and he's always worry for travellers. He succeed the whole trip, according to needs and requirement of mine. I made a return trip to do the EBC Trek. My first visit was in October 2017 to do Annapurna Circuit with Amazing Nepal Trek. I decided to go with the same company this time too. 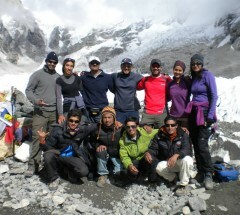 Amazing Nepal Trek was very professional, well organized and the assembled team made the trip relaxing and enjoyable. I would highly recommend this company to anyone making plans for a trek in Nepal.